Health experts tend to focus on avoiding unhealthy foods — but is that really the best approach? Eating healthy foods is more important than avoiding unhealthy foods. That is the conclusions of a new study on 15,000 people with coronary artery disease in 39 countries. A “Mediterranean” diet rich in fish, unrefined foods, fruit and vegetables helps to lessen heart attack and stroke in people with heart disease. 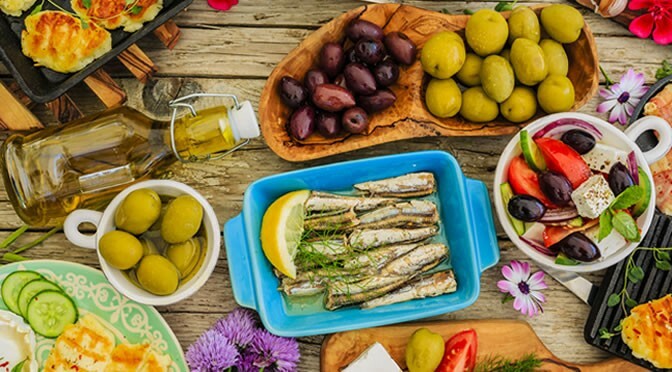 The research led by Professor Ralph Stewart at University of Auckland, New Zealand found that people who consumed high amount of healthy “Mediterranean” foods had fewer strokes and heart attacks. This was compared to people who were avoiding unhealthy foods such as sugary drinks, deep-fried foods, refined grains, desserts and sweets — all part of the so-called “Western” diet. In this study participants were asked how many times a week they consumed dairy foods, fish, sweet and desserts, meat, fruits, vegetable, deep-fried foods, sugary drinks, alcohol and whole grains or refined grains. A scoring system was used: a “Western diet score” (WDS) and a “Mediterranean diet score” (MDS) with a total range of 0-24. The WDS was based on assigning points for increased consumption of unhealthy foods whereas the MDS assigned points for increased consumption of healthy foods. The research followed up the patients 4 years later. Heart attacks, strokes and deaths were much lower amongst the participants who scored over 12 MDS (subjects who consumed high amounts of healthy foods). “After adjusting for other factors that might affect the results, we found that every one unit increase in the Mediterranean Diet Score was associated with a seven percent reduction in the risk of heart attacks, strokes or death from cardiovascular or other causes in patients with existing heart disease. “The main message is that some foods — and particularly fruit and vegetables — seem to lower the risk of heart attacks and strokes, and this benefit is not explained by traditional risk factors such as good and bad cholesterol or blood pressure. If you eat more of these foods in preference to others, you may lower your risk. The study found no evidence of harm from modest consumption of foods such as refined carbohydrates, deep fried foods, sugars and deserts. However, because the assessments were relatively crude, some harm cannot be excluded. This study was published in European Heart Journal (Stewart et al., 2015).